Can I use multiple Tomcat in same machine? I strongly recommended zip or tar.gz version, not use installer version for development. Certainly, installer version is easy to install and manage, but not flexible for development. Install Java and Eclipse is just straight forward. No explanation. This is Java JDK path. By default, C:\Program Files\Java\jdk1.7.0_40\bin is java home. Download Tomcat and unzip under c: The name is long, I thought. 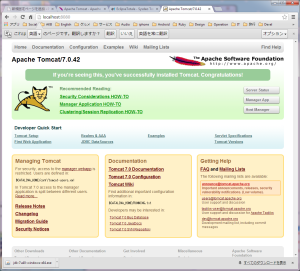 Change “tomcat7”. 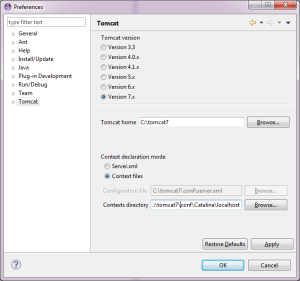 Download plugin form Eclipse Totale. 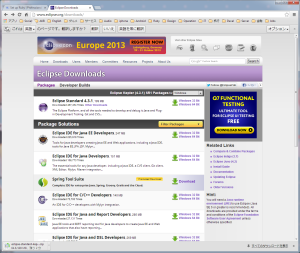 dropins folder is under eclipse you installed. In my case c:\eclipse\dropins. 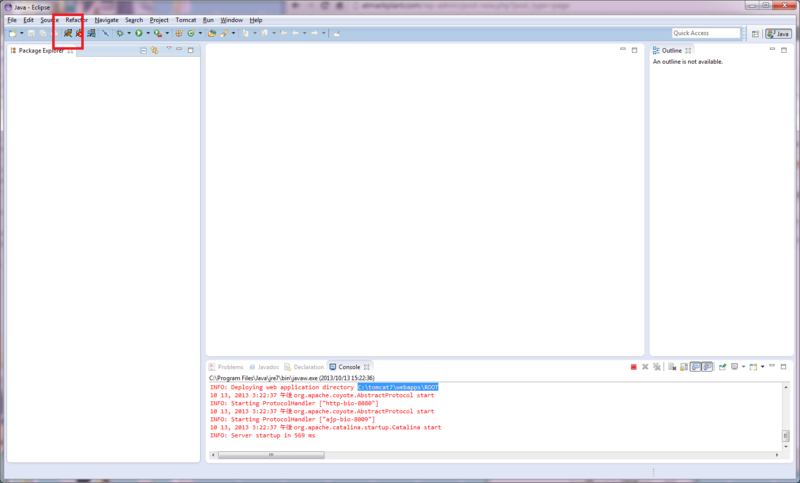 Next is eclipse tomcat setting. To use Tomcat from eclipse, we need setting. 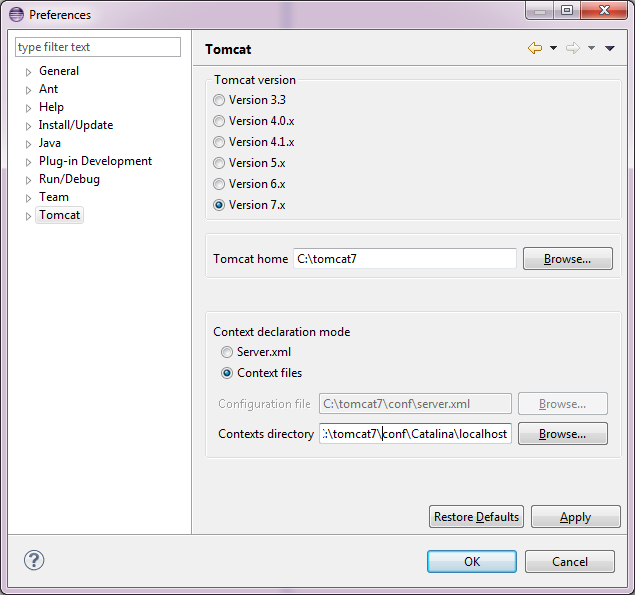 Please select Tomcat version(in this case Tomcat7) and select tomcat7 directory. Other is not required to change. Access http://localhost:8080, you can see default application page. 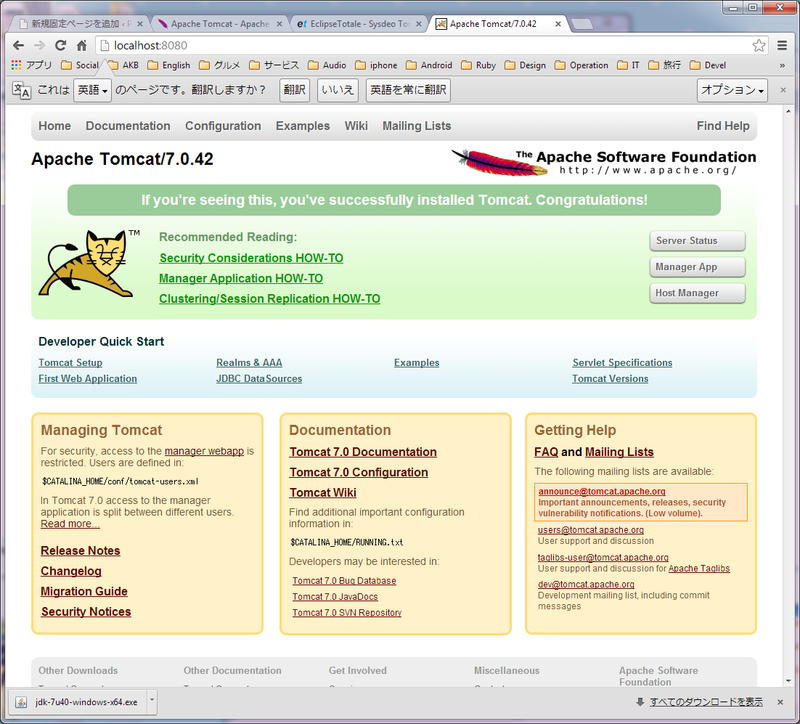 Actually, I use 2 tomcat in same machine and test 2 Web applications which uses different tomcat process and port. In application, we run application as root, so ROOT.xml as context file(TOMCAT_HOME/conf/Catalina/localhost/ROOT.xml). Very efficiently written article. It will be beneficial to everyone who employess it, including yours truly :). Keep doing what you are doing – can’r wait to read more posts.